It is an established fact that USB flash drives are commonly used in college campuses and offices. Nevertheless, such digital storage devices like these might soon be seen in all places, such as in pill bottles, groceries and even clothing. All this can be possible due to the increase in printable electronics. A research team from Duke University has developed an innovative “spray-on” digital memory device making use of only nanoparticle inks and an aerosol jet printer. The discovery takes us one step nearer to a future of inexpensive, flexible electronics. The device is equivalent to a 4-bit flash drive and is the first fully printed digital memory that can be practically applied in simple electronics such as RFID tags or environmental sensors. Moreover, since the device is jet-printed at comparatively lower temperatures, it can be applied for constructing programmable electronic devices over bendable materials such as fabric, plastic, or paper. 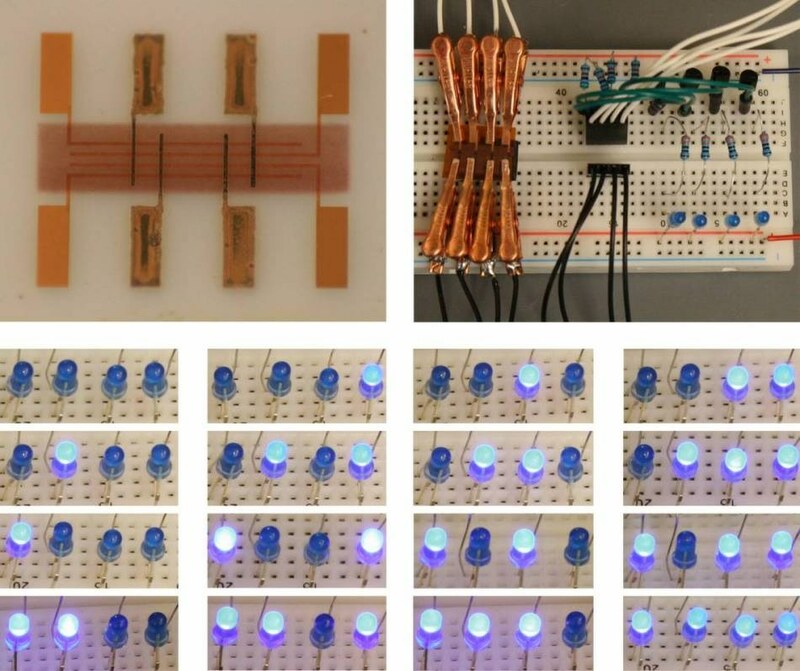 “We have all of the parameters that would allow this to be used for a practical application, and we’ve even done our own little demonstration using LEDs,” stated Matthew Catenacci, a Duke graduate student. He has reported on the device in a paper published online in the Journal of Electronic Materials on 27 March 2017. The size of the new device is equivalent to that of a postage stamp. An innovative copper-nanowire-based printable material with the potential to store digital information is positioned at the core of the device. Memory is kind of an abstract thing, but essentially it is a series of ones and zeros which you can use to encode information. According to Wiley, majority of the flash drives encode information through a series of silicon transistors with the ability to exist in a charged state, which corresponds to a “one”, as well as an uncharged state, which corresponds to a “zero”. The innovative material is formed by enclosing silica-coated copper nanowires in a polymer matrix, and instead of encoding information in states of charge it does so in states of resistance. When a small voltage is applied, it is switched between a high-resistance state in which electric current is cut off, and a low-resistance state in which current is permitted to flow. In contrast to silicon, the polymer, as well as the nanowires, can be dissolved in methanol, developing a liquid that can be sprayed through a printer’s nozzle. We have developed a way to make the entire device printable from solution, which is what you would want if you wanted to apply it to fabrics, RFID tags, curved and flexible substrates, or substrates that can’t sustain high heat. As a first step in developing the device, Catenacci made use of commercially accessible gold nanoparticle ink for printing a sequence of gold electrodes onto a glass slide. Next, the copper-nanowire memory material was printed over the gold electrodes. Lastly, a second sequence of electrodes was printed, but on copper. Catenacci demonstrated an easy application by linking the device to a circuit comprising of four LED lights. “Since we have four bits, we could program sixteen different states,” stated Catenacci. Each “state” is correlated with a particular light pattern. Considering a real-time application, each state can be programmed to correlate with a letter, a number, or any other display symbol. Although, in the recent past, different research teams have developed almost identical printable memory devices, the new device is the foremost to merge principal characteristics required for practical application. The write speed, that is, the time taken to switch between the states, is nearly 3 µs, which competes well with the speed of flash drives. Investigations reveal that written information can be retained for nearly 10 years. Also, the material can be re-written for a number of times without being degraded. According to the researchers, although the memory capacity of these devices is way too small, rendering them unable to store music or digital photos in the near future, they can come in handy for applications that aim at flexibility and lower cost. For example, right now RFID tags just encode a particular produce number, and they are typically used for recording inventory. But increasingly people also want to record what environment that product felt—such as, was this medicine always kept at the right temperature? One way these could be used would be to make a smarter RFID tags that could sense their environments and record the state over time. A National Science Foundation CAREER award (DMR-1253534) and the Duke SMIF Voucher Program supported this research.